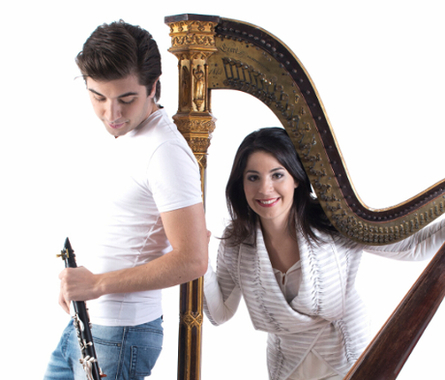 Expect passion, technical aplomb and an exceptional chemistry between two dazzling virtuosi as Anneleen Lenaerts, Principal Harpist of the Vienna Philharmonic performs with Dionysis Grammenos, dubbed by one critic as "the new prince of the clarinet". Belgian-born Lenaerts has garnered an astonishing 23 international awards as a solo player, most notably at the Grand Prix International Lily Laskine, as well as performing with many of Europe's leading orchestras. Greek clarinettist Grammenos is widely recognized as one of the most charismatic and inspiring artists of his generation. In 2008 he won the Grand Prix d'Eurovision and the title of European Young Musician of the Year. He regularly performs at some of the world's most prestigious venues. The duo's much anticipated debut CD is due for release in October 2016. Chamber music-making of the highest order! A programme of music by Schumann, Schubert, Anne-Marie O'Farrell (new commission), Smetana and Verdi.